“I have been fortunate to play with a Hall of Famer in Jerome (Bettis), I know he is. When I came in, to have a leader and a player like that was so beneficial. One of the great running backs of all time and it’s awesome. I think that Bell is on his way. (He’s) still young but the things that he can do in all three phases of the game to run, to catch the ball and to block are some of the most special things I’ve ever seen a running back do.” — Ben, on Le’Veon Bell. We have to win it. They’re a division leader. We know that we’re going to get everything that they have. We’re going to do everything we can to give it our best shot. I disagree with the talking heads because they’re a good defense. They’re playing at home in that Georgia Dome where it’s loud and they’re on turf. It’s a big, tough task for our offense. What are some of the challenges that Atlanta’s defense poses? I think that they get after the quarterback. They have a good pass rush. I also think their secondary, they have some young players back there that are making plays, ballhawks that are very opportunistic. When the ball is in the air and they find a way to come down with it. When the defense is getting hit with big plays do you feel that the offense has to respond with big plays and scores? We always want to respond regardless. We always talk about answering a score with a score. So regardless of if or how the other team does it, we feel we want to do that anyway. How important is that and who does it benefit more mentally? I think any time the other team scores, if you go score (or) answer the score with a score, it really kind of picks you back up because the momentum is starting to change and shift. Whether it’s with the crowd or with the team, if you can answer another team’s touchdown with a touchdown of your own it’s really beneficial for you. We don’t care about that. We’re just trying to win football games. We have a lot great football players on both sides of the ball and I think each guy individually is just doing everything they can to help this team win football games. 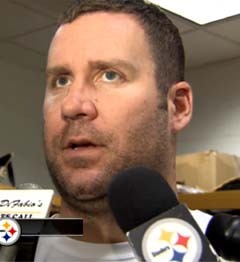 What has Matt Spaeth given the offense especially as a blocker? The thing (is) that he catches two balls last week and everyone makes a big deal about it. He’s just an unselfish player. That whole room is a very selfless group. They’ll pull, they’ll do a lot of grunt work up front that they don’t get all the credit for. But I know that here in this building, and Le’Veon will tell you, how much those guys mean to him and to us as an offense. Did you miss Ben’s radio show yesterday? You can read the highlights and listen to the podcast here. Busy today, busy yesterday morning….what about last night? Ben joined several of his teammates to support Brett Keisel and Cam Heyward as they co-hosted the 65 Roses Sports Auction to benefit the Cystic Fibrosis Foundation. The event took place at the Sheraton Pittsburgh at Station Square. You can enjoy a few more photos here.